The RYA Powerboat Handbook is the RYA’s top selling comprehensive guide to powerboating and is rated No1 by Amazon in the sector. It is available in English, Arabic, German, Italian and Portuguese. In 2003 Paul met with the RYA to discuss writing the RYA Powerboat Handbook for them. At that stage the RYA had just started its RYA Handbook series and the stable included just the RYA Navigation Handbook and the RYA Weather Handbook. Paul had already written for a number of magazines for some while and was asked to propose the structure of the book and produce a sample chapter. In about May 2003 the RYA signed Paul up to write the book. The deadline for the text was October 2003 so the race was on, as he was travelling a lot at the time pretty much every night in a hotel and most weekends were taken up writing the text. The struggle was never what to write so much as how to write very little to say lots. Any good book in this market is only as good as the images and this is where this handbook comes into its own. Paul sketched out all of the images for the book so that they linked directly to the text. He then met with Pete Galvin the illustrator who the RYA had decided would artwork all of the images. As anyone who has seen the book will agree Pete did an amazing job and managed to bring to life in an attractive and vibrant way such difficult to draw subjects as using springs to bring a boat alongside and helming a craft with twin engines. With this in hand the next job was the photos. Paul produced a list of about 100 photos that were needed and agreed with the RYA that he would take about 60% of them. Many hours were spent photographing boats (mainly at our home base at Cobbs Quay) and a few on water photo shoots arranged to fill in the gaps, manufacturers supplied some images and local chandlers and engine dealers provided kit for some of the photos. The text was submitted on time in October and the process of reviewing and refining Pete’s work, choosing and sourcing photos continued well into 2004. The text was reviewed by a mixture of Jon Mendez, Paul Mara, Simon Jinks and Phil Williams-Ellis at the RYA for technical accuracy and to give an ‘alternate perspective’ and was artworked in about mid 2004. It was then sent to a different artwork company to be further improved resulting in just missing the 2004 Southampton Boat Show. All was ready for London 2005 though and in January 2005 the book launched. The book was well received by the boating press and received some very good write ups across a number of magazines. Many of the images, a number of photos and some of the text have gone onto be used in the RYA’s Powerboat Level 2 course book – Start Powerboating. Start Powerboating focusses on boating handling and the RYA courses up to and including Level 2 and is a direct replacement for the RYA Powerboat Practical Course Notes. It too is available from the RYA website or Amazon. As Paul would agree writing the book was hard work but great experience and huge fun. Would he do it again? – He has! Paul has since written the RYA Advanced Powerboat Handbook which has been equally well received. Since launch, the book has been translated into German, Italian and Portuguese. A dual English/Arabic version also launched in late 2013 as the Dubai Powerboat Handbook. The book is regularly reprinted and at each reprint a few minor amendments are made to update images or photos. In 2009 the book was fully updated by Paul as Edition 2 and 2014 saw the launch of Edition 3. The new ‘RYA Powerboat Handbook’ is the latest title in the RYA’s best selling handbook series. Encompassing the expert knowledge that has made RYA training courses revered worldwide the ‘RYA Powerboat Handbook’ is essential reading for anyone who goes day-cruising in a sportsboat, day-fisher or RIBs. The handbook provides easy to follow instruction on how to launch successfully, berth, boat handling at low and high speeds, navigation and other essentials such as weather, rules of the road, and how to recover at the day’s end. 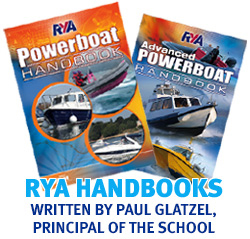 The ‘RYA Powerboat Handbook’ is written by Powerboat Trainer, Paul Glatzel who has been passionate about the water since his teens. Paul runs a powerboat school in Poole (www.powerboat-training-uk.co.uk) provides a valuable source of training information via his contributions to www.powerboat-training.co.uk and he also writes for Sportsboat & RIB Magazine. With a forward by 6 times world powerboat racing champion Steve Curtis the book already has the stamp of one powerboater. Curtis said “No matter what type of powered craft that you use, RIBs, fast planing craft, dive boats, fishing boats, or a boat for waterskiing, you need training and knowledge and this is where this book comes in. It will prove to be not only a perfect learning tool but an invaluable reference.